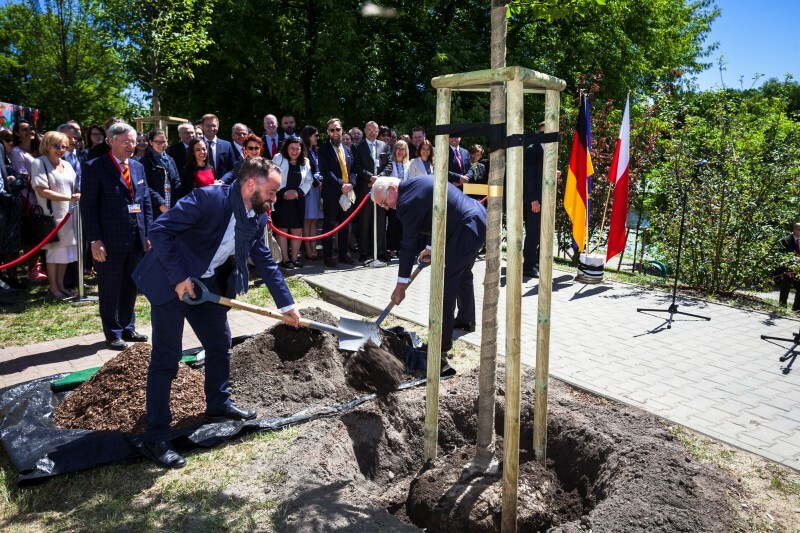 On Wednesday, 6 June 2018, the President of the Federal Republic of Germany Frank-Walter Steinmeier ceremoniously planted a common hornbeam (Carpinus betulus “Fastigiata”) together with the Deputy President of Warsaw Michał Olszewski in the German-Polish Gardens. Warsaw’s greenery and park plans are not just about aesthetics. Many residents spend their leisure time there, enjoying a rest from the hustle and bustle of the city. Greenery requires care, patience and dedication, therefore it is an important element in building relationships, both between close neighbours and those general — social and political. Such ideas inspired Embassy of Germany in Warsaw and Warsaw City Hall to sign the letter of intent to revitalise the greenbelt at the northern shore of Kamionkowskie Lake. The Polish-German Garden has been designed as a local-social project, initiated by the diplomacy, but carried out in cooperation with ecologically-involved private persons and business representatives. At the same time, it constitutes an element of a targeted initiative of the City to plant one million trees in the urban area of Warsaw in the upcoming years to meet the residents’ expectations in respect of eco-friendly policies. Apart from the German-French Saarbrücken Garden and the German-American Friendship Garden in Washington, the Polish-German Garden is the third project of this type in the world. It is built as space for rest and meetings, therefore key aspects are silence and tranquillity of the Skaryszewski Park area at the rear of Grochowska Street and planting of carefully selected plants — some of them will naturally filter water in the lake. The construction of the Garden is accompanied by regular public consultations as well as workshops and public planting events, organised together with the business partners. The design of the Polish-German Garden was developed in cooperation with Urbanistyka i architekektura krajobrazu Coqui Małachowska Coqui. The Gardens will direct the attention of visitors, in particular young ones, to the fauna and flora of the place and educate about the rich garden culture of Poland and Germany. The project is a response to the need to complement city greenery — an indispensable element of modern smart cities. Until 2019, new flowers and trees will be planted in the Polish-German Garden in addition to installation of new benches and cycle paths. The works have already started, but both individuals and companies can still join the group of Patrons, Partners and Friends of the Project. So far, these include the Patrons: LOTTE Wedel, Lorberg, Pepsico i Siemens, the Partners: HOCHTIEF Polska, Mercedes-Benz, Rotary, T-Mobile Polska and the Friends: AGS Warsaw Bayer, Bosch, Deutsche Bahn, Deutsche Bank, ECE Projektmanagement, eon, GfK Polonia, mBank, PwC, REMONDIS, Rotary, STIHL, STRABAG oraz Veolia.